Facts and history about the life and lifestyles of Native American Indians. Native Indian Canoes were the primary method of transportation by many tribes of North America who relied on them for hunting, fishing and trading expeditions. Three main types of canoes were built, dugout, birch bark and tule (reed) canoes, and their designs were based on the natural resources available in the different regions. The Northeast woodlands, and the tribes of eastern Canada built canoes made from the bark of trees (the birch bark canoe). Tribes in the Northwest Pacific Coast, California and the Plateau regions built dugout canoes. Some Californian tribes built canoes made from reeds (the tule canoe). The life, history and lifestyle of Native American Indians is a varied and fascinating subject. The following fact sheet contains interesting facts and information on Native Indian Canoes. For additional facts and history refer to the articles on the Birch Bark Canoe and the Dugout Canoe. Native Indian Canoes Fact 5: The sizes of the boats varied according to the reason they were built. A canoe could take as few as one person, although were usually built to take between four and six people. Native Indian Canoes Fact 6: The smaller type of canoe was used for transportation purposes along the many waterways of the lands for hunting and fishing trips. 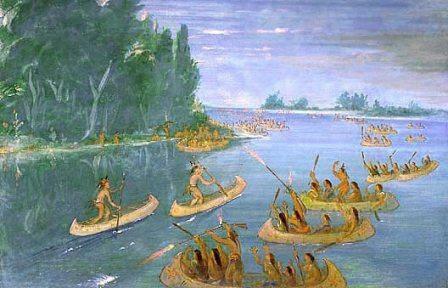 Native Indian Canoes Fact 10: Some tribes used the boats for recreation and sports. The picture at the top of the page by the famous artist George Catlin depicts a canoe race held by the Chippewa (Ojibwe) tribe. The races are shown standing in their canoe to achieve the greatest speed and enhance their balancing skills. The race not only gave great pleasure to the spectators but also trained the young men in the art of steering and paddling the canoe. Native Indian Canoes Fact 12: The dugout canoe was built using hollowed-out logs of large trees. The Native Americans hollowed out logs using controlled, frequently extinguished fire or a steaming technique to soften the timber so they could carve and shape their dugout canoe to have a flat bottom with straight sides. Native Indian Canoes Fact 13: The highly ornate dugout canoe was built by Northwest Pacific Coast tribes such as the Bella Coola, Tlingit, Chinook, Haida, Tsimshian, and the Coast Salish. Native Indian Canoes Fact 16: A more basic style of dugout canoe was built by the tribes who inhabited the Plateau region including the Coeur d'Alene, Nez Perce, Cayuse, Modoc, Palouse, Spokane, Walla Walla and the Yakama tribes.